NOTE: Due to freight shipping limitations, this item can’t be processed thru our online store. To order, contact us at 888-220-3002 or onlinesales@bullseyeglass.com. A true workhorse, used by Bullseye studios for years. Versatile for flat fusing, slumping, small-to-midsized casting, and pâte de verre. • Top, side, and door elements. • 12-key Sentry 2.0 digital controller. • Safety interlock to disable elements when door is open. Shipping Method: This kiln ships via truck. New kiln? See our FREE video Bringing Home Your New Kiln for information on tools, furniture, kiln placement, and how to prepare for your first firing. Which molds will fit inside the Paragon GL24 Kiln? We've taken the guesswork out of choosing the right-size mold for your kiln. 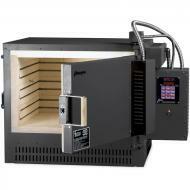 Click here to browse the selection of molds you can fire in the Paragon GL24 Kiln.